Beaverton Mayor Denny Doyle: Tell Sister City Cheonan, South Korea, That We’re Opposed to the Torture and Consumption of Dogs and Cats. Beaverton, Oregon became Sister city to South Korea’s Cheonan in 1989. Yet Cheonan, South Korea is responsible for the ongoing horrendous torture and killing of dogs and cats. One of the country’s largest markets in South Korea, that auctions dogs both for pets and for meat, is the infamous “119 Dog Auction Market” in Cheonan. If you have ever wondered what hell would be like, just visit this dreadful place, or watch the undercover videos of this Market. This is literally a “Hell on Earth” where helpless dogs, squashed up in cage after cage, are auctioned off to restaurants and slaughterhouses. In Cheonan, there are countless markets, restaurants and farms where the dogs, which are tortured their entire lives, end up being slaughtered in the most inhumane ways, such as by electrocution, hanging or beating; and then being thrown into boiling water – sometimes while they are still alive. In many places, dogs are being killed in full view of other terrified caged dogs; and this takes place in public and in broad daylight. In addition, many abandoned and stolen former pets end up in these markets, and are subjected to the same cruelty. 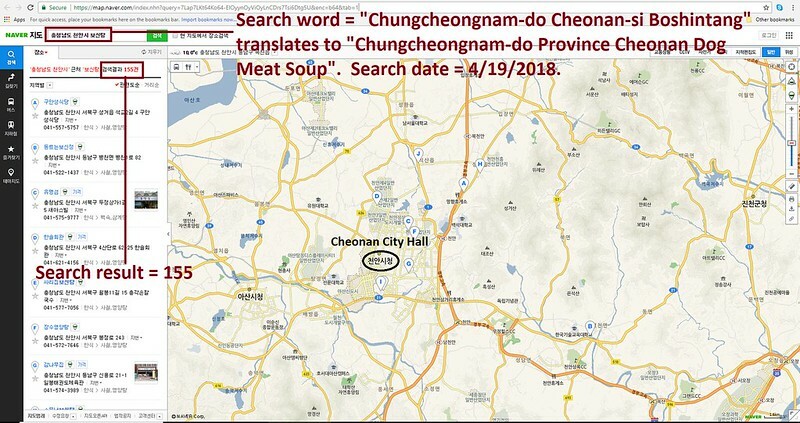 A Search Engine reveals the sickening scale of Cheonan’s dog meat demand. 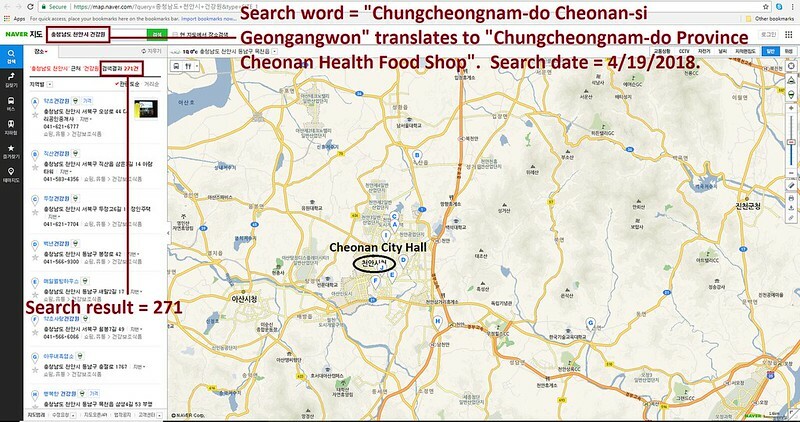 The searches resulted in: 271 Health Food Shops; and 155 restaurants in and around Cheonan. Even if half of these ‘Health’ Food Shops and restaurants serve dog and cat ‘ingredients’ in one form or another, just imagine how many dog/cat slaughterhouses must be present in and around Cheonan in order to supply all of these outlets. The Mayor’s office is making a list of all the calls they receive regarding this issue. Based on the number of calls which show how much interest and support there is, the Mayor will decide on the course of Action. So please pick up the phone today and make a difference. Please sign petition, call and email Beaverton Mayor Denny Doyle TODAY! Call the Korean Embassy and Consulate General’s offices in your country! USASend a copy of your letter to the Cheonan Mayor Bon-Yeong Gu! Please watch undercover video from the 119 Dog Auction Market in Cheonan, South Korea: https://youtu.be/9cfDt1_NNvY And please watch this news report from Korean TV: http://koreandogs.org/cheonan-illegal-dog-breeding-and-slaughtering/. No matter where you live PLEASE SHARE these actions with your friends – especially those who live in Beaverton! Please, stop this cruelty immediately!!!!! Terrible….. I agree. This is evil, sick, twisted behaviour. Not to mention the fact that dog meat isn’t fit for human consumption! Please help these poor, beautiful animals. They deserve love, peace and respect. Stop this cruelty. It’s time to be humane. My God … do I hate those Asian bastards. RESCUE THESE ANIMALS AND SHUT DOWN THESE HORRIFIC DOG & CAT MEAT MARKETS! — IT’S SHAMEFUL AND INSANE! Please stop eating dogs and cats!!! Please leave these sentient beings alone. Do not do to any creature, what you would not like done to you. Deep down, you know that this is right. Totally and utterly disgusting treatment of animals and totally and utterly disgusting that a city in the civilized world can pair with such barbarity! You need to stop these barbaric practices. Eating dog or cat does not cure cancer. Shame on anyone for letting this happen and shame on the people who do it. Sick minds! Dogs and Cats are pets, NOT FOOD !!!!!!!! Please stop these murders. What kind of people are capable of actions like this!!! You sickos, you think dog and cat meat cures cancer! Get in your right mind. Barbarians. Dear Korea, it’s simple, stop your barbaric treatment of dogs because the world is looking in horror at what you do. Never buy KOREAN PRODUCTS while they continue this gross cruelty . Why are people so stuck on this psychopathic practice? Why does the government do nothing to end this? STOP RIGHT NOW. YOU HAVE NO COMPASSION FOR ANIMALS. YOU MIGHT DRESS LIKE HUMANS … BUT AREN’T. THERE IS SOMETHING CALLED KARMA … YOU KNOW WHAT HAPPENS WHEN YOU INFLICT PAIN TO OTHERS …. IT COMES BACK TO YOU. I have Koreadogs.org in my will (when I die) please everyone, consider putting them in your will (at least some). As you can see, they are always actively fighting dog cruelty in South Korea, & I strongly believe from reading their many posts, that they would try to do the right thing with the money, to save & help, as many dogs as they could; from the cruel dog butchers of South Korea. PLEASE!!! STOP SADISMO Y BARBARISMO PARA COMER PERROS y GATOS en S.COREA! STOP!!!!! STOP CRUELTY !!!!! save dogs and cats from being butchered. they are companion animals pets. How Barbaric and Savage! ! ! !… dogs and cats are our companions…you don’t eat your companion! ! ! ! I ask and expect that Koreans must stop this torture. To all Koreans…….Please stop this torture of the beautiful dogs and cats in your country. I’m one of the korean student trying to help animals and precious life.when there’s a case like this, i feel guilty and sorry to all the precious life in earth(plants, animals…)that I couldn’t help them. please help Innocent animals i will pray for them……. Thank you, Grace for caring! Please keep fighting and help the dogs in Korea. They need you and you have the power to make a difference. Bless you! Authorities must stops that criminal action! All this people who hurt these dogs and cats have to suffer also in this life or much more lives. These animal murderers will not listen to the animal protection laws telling them that it is illegal to slaughter dogs and cats. It is time to physically stop them. Chop off their hands. God would not be so kind, God will destroy the evil and the wicked in this world, and the animals are not evil and wicked. Comment la Corée qui se veut un pays moderne peut-elle permettre ces horribles cruautés ? Ces atrocités doivent cesser immédiatement. PLEASE DON’T SLAUGHTER THESE DOGS AND CATS! This is a barbaric practice and the western world looks very unkindly towards those who follow this practice. The Chinese in China are still eating dogs and cats; this is NOT the way Korea should be following. These are our PETS NOT FOOD! Get with the times – tourists coming to your country will expect better from you – don’t let yourself fall short of higher principles; not because you are forced to but because IT IS THE RIGHT THING TO DO – PLEASE STOP THIS INHUMANE SLAUGHTER OF THE DOGS AND CATS OF KOREA!! We here in Australia implore you!!! I can’t believe what I’m seeing. I will never step foot into your disgusting world of torture and killings for your stomachs. You people should be taken off this face of the earth. Go eat something else it’s not the dark ages it’s modern times. Never will I or my kids or friends ever come to a country who does this to innocent animals. PLEASE DON’T SLAUGHTER THESE POOR DOGS AND CATS ! They are our furry babies ! Sickening … Join the civilized world. ESTO NOS ESTÁ PASANDO A TODO EL MUNDO Y ES PERTURBADOR, INACEPTABLE E IMPERDONABLE. DETENGAN ESTA BRUTALIDAD!!!!!! Stop this brutality these loving animals do not deserve this the world is watching it is world wide I am boycotting all goods from your country’s until this evil stops. I lived in Cheonan for over one year, yet never heard of this dog market. However, I did know that some restaurants served dog meat. ? Since I was an English teacher, I asked my classes (middle school students) how they felt about eating dogs, and in every class there were always a few students who had eaten it and many, I would say the majority, who were vehemently against it. Hopefully as the younger generation comes of age and fewer people remember the times of famine in Korea’s history that likely started this practice it will become less common and eventually outlawed.